On Friday, March 30, we will be performing a scheduled maintenance window for our Work2Go service. The maintenance window will begin on March 30, at 20:00 Swedish local time, and end on Sunday, April 1, at 18:00. The Work2Go service will not be accessible during the maintenance window. Incoming e-mail will be securely stored and is available as soon as the service returns to normal status. We apologize for the inconvenience caused by this. From Friday, March 30, at 20:00 Swedish time to Sunday, April 1, at 18:00. In order to meet our customers’ needs with new Work2Go WebPlatsen i Sverige AB launched its own site for Work2Go. It is packed with guides, FAQs and other useful help. The site is alive and new information is constantly updated with what our customers want. It is an exciting time that is now before us to take Work2Go to new heights. If your password is on this list, or a close variation of these passwords, it is really important that you do something about it now with a time! The longer the stronger. Generally speaking, one can say that the longer the password, the harder it is for someone to try to crack the password. Instead of a single word mixed with symbols, numbers and characters, try a string of words. Use a line from your favorite poem, song, or just something memorable, and feel free to add some of your memorable speech / dates. Such as ‘eat_cake_at_8!’. Suddenly, you have a 24-character long password, which is much harder to crack than something that is very difficult for you to remember, such as ‘hu!R7tRjX’. Variety is the spice of life. The problem with the shorter but more complex passwords is that they can be quite cumbersome to remember. Therefore, it is also common to choose to use the same password for multiple accounts simultaneously. It is never a good idea. So another advantage of having long passwords that are easy to remember, is that it is easier to have multiple passwords. Confirmation message sent or displayed when a person has done something on the web, for example, made a purchase, signed up for something, filled out an application to receive offers via e-mail, etc. are important and should not be overlooked. A successful confirmation message may lead to more satisfied customers, more sales and less traffic to the support department for questions about what happens next. To simplify your work as you create your own confirmation messages, we have made a checklist of ingredients that you should include in confirmation messages. Use a valid reply address (avoid the no-reply). Remind the customer in the subject who you are and what the purpose of the email is. Thank the customer no matter how big or small the purchase is. Give customers the answers to all possible questions about the order as best they can. Please link to the detailed answers on your website. Information should be short and concise so the customer quickly get an overview. Short sentences and bulleted lists. Clear links to your website. Clear “call-to-action”. What should the customer do next? Personalizing message with the client’s name or the like. Always use your logo so that the recognition factor is high and immediate. Include all the information so that replacement or adjustment becomes easy for the customer. View policy and that you value the information about the customer and will only use it for the benefit of the customer. View all purchase conditions and other information that the customer gets to feel safe (ideally as a link to your website where all the information is available). Have e-mails in HTML and preferably with pictures. But if you also have the option to send a message in plain text, so do not forget it! E-mail, such as sent to a some systems rarely show more than just plain text. Since a lot of you seem to have issues to log on to your account in Internet Explorer, after the last major update from Microsoft Windows, so we thought we would hear of us to all of you and tell you how easy it is to solve this. While it is always nice to help you over the phone. But you can of course have other things to you that you would rather do than to call us. So if you use Internet Explorer, it may be useful to know that if you suddenly can not log in to your Work2Go account as usual, you only need to do a single click to proceed as usual. Click the paper icon up in the address bar and the problem is solved! This is something that just needed to be done once. The next time you open the browser again, it will remember the setting and show your account in the correct format. With the latest critical update from the Microsoft Windows includes an update to Internet Explorer Web browser 10. This update is automatic on most computers. Therefore, it is not certain that you notice that you get a new version of Internet Explorer 10. People are becoming more adepted to just ignore incoming emails. While Gmail and Hotmail helps and facilitates this behavior by offering smart inboxes with filter function that the user can use to get their incoming messages sorted automatically. E-mail from our families, friends and colleagues, however, e-mails that can be seen as “signals.” We take the time to read the mail and do it often with great interest. But the e-mails are not the only fact – sometimes the mail from companies or complete strangers that we also love to read. Why? Because these emails are interesting, engaging and most importantly, they are full of personality. We have become better at being selective in what we consume / read so as not to drown in our overflowing inboxes. E-mail from Dad or a lifelong friend prioritized, because they are people we know and trust. E-mail outside of our circle of acquaintances? Not so much. Our brains have an upper limit, we are unable to focus on any number of things and our mental ability to care about the things that interest us well decreasing every time. But while we long for interaction, whether it comes from a trip to an unfamiliar part of the world, from conversations with friends or all the stories delivered by a news channel which broadcasts around the clock. We want to be engaged by the ideas of other people. It is built into our psychology. What can we do to make our mailings more engaging? How can we ensure that people are eager to read it? What gives a message a personality? Before we can answer these questions, we must overcome a few problems that lie in our way. The first problem is man’s inability to multitask. In “The Myth of Multitasking” indicates Christine Rosen plenty of evidence to suggest that our brains simply are not connected to doing several things at once. Many people think they can perform multiple tasks simultaneously (like sitting at their computer and surf the web while talking on the phone and taking notes). But it is wrong. What we are really doing is that we are moving sideways, changing quickly from one task to another task. Because of this, we end up in a state of “continuous partial attention”, a term coined by Linda Stone to describe our broad focus from one task to many. Whether this kind of shared focus is a bad thing depends on the context. The function reasonably well when we sit at our desks, but to take the phone call when we’re behind the wheel can lead to a very serious accident. Our inability to maintain a high level of interest in a subject can be traced to what in psychology is called “secondary traumatic stress” or as they colloquially call “mental fatigue”. You’ll find the mental fatigue of almost any nursing profession anywhere – therapists may eventually need his own therapist, a doctor’s ability to talk well with his patient can cool down over the years. You’ll find it often in customer service, where burnout is very common. A growing cynicism and a news media that never stops broadcasting is another clear example that makes people become more and more tired of all interactions with other people and the processing of new information. Mental fatigue is our big problem. In order to capture someone’s attention, we must first overcome these problems. When it comes to e-mail is the biggest challenge to convince people to take the first look and then get them to care enough to maintain interest in the long term. While people are becoming more demanding with the information they learn, we also have to become more discriminating in what we give to them. Getting people to open an e-mail can be very difficult. Inboxes seems all be filled to the brim, so finding something that stands out against the crowd is essential. Getting into a captivating interesting content in the subject line is arguably the best solution to start with. However, there is no shortage of theories about what tone works best, or which words should be avoided, or how long a subject line should be. There is no exact science, but a plethora of studies and theories. One of the more interesting studies investigated the subject line from the last election campaign for US President Barack Obama. The emails consisted of short and familiar formulations in the subject line such as “Would love to meet you,” “Do this for Michelle” and “Hello”. Formulations that are more likely to be spam than mails from a political campaign. Just as e-mail, I can find in my junk folder today: “See!”, “Check here,” “Hello”. But it turned out that the email with the subject line “Hello” was extremely popular during the election campaign. The only word in the subject line, with a personal tone, drew a great attention of millions of people. The simplicity and the relaxed tone worked. To achieve success with their email campaign came not only from mejlens subject line. The subject line was only the first step to awaken interest. It was the content of the email message, written with a familiar and personal tone, a stark contrast to what one might read in a political e-mails, which sold the message itself. Another example of a successful e-mail distribution whose success is found in the content is Dave Pell Next Draft. Pell’s secret is that he blurs the line between e-mail exclusively attributed to a person and e-mails written to many. “I write my mailing just in the same tone that I would write an email to a single person.” Texts available on a website and that contained in a mailing to be handled differently. The contrast between the two should be sharp. But many of the emails that come to our inboxes today can be considered more of a “website lite”. When they should instead be specially written and adapted to the more personal touch that e-mail allows. Getting on the exciting subject lines and contents will not take you anywhere if you write it to the wrong people. Knowing your target market and what they expect is an important factor when you are writing a successful newsletter. In the Next Draft reason Pell with their readers in a reassuring and familiar tone which means that each number is perceived as valuable. Knowing his readers is easier when you have a narrowly defined target group. But it is not always obvious from day one, which target your readers actually are. Obama’s campaign turned for example to everyone, everyone who at some point had indicated his interest in his mailings. But over time, all had not stayed on the mailing list. But the majority of the readers did not disappear. In this case comprised the remaining audience is very likely precisely democrats and independent supporters of the president. The audience is part of what in psychology calls “being as a group,” a collection of people who all share a collective identity, in this example will be devoted Obama. In view of this, it was not really the subject line “Hi” so controversial. There is a quote that reads, “I do not know the key to success, but the key to failure is trying to please everybody.” The remaining readers were already inclined to open the e-mail message as long as it came from the Obama campaign. A targeted audience who is emotionally involved is exactly the right group to target their message to. A combination of a striking subject line, interesting content and an ideal audience leads surely to e-mails are opened and will be read, but in the long run, we also need an ingredient for success over a long period of time, namely: trust. When people subscribe to a mailinglist, they seek actively a relationship with the creator and the trust that the communications they receive will have no value. Here, the Next Draft is the perfect example. Dave Pell’s readers trust his statements and trust to be served a summary of the most important and relevant news. It is a great responsibility for Pell, especially considering that some of these readers might use the Next Draft as one of their few news sources. In a world where everyone has too much to worry about, can not take many people to keep up with all the current events by self-search for the specific news on various websites, but rely instead on someone compiles information about them. There may be friends, blogs or half-hour comedy news programs on TV such as Helt Apropå from 80-90s or The Daily Show. With this in mind, we can see how Pell itself acts as a news source. He recounts not only content from different sources, he selects meaningful stories, add comments, and will help the reader to digest the content – much like a news anchor as you can see summarize the day’s news in the evening. Pell develop a credible voice with a sense of weight, but he can also be fun and lighthearted, and his tone customized by the news he summarizes. Pell’s personality, combined with his interesting and reliable content enhances the reader’s confidence in him. His mailing resembles something that we could have got from a friend. Pell says there is “a certain level of intimacy to the exchange … People will not let me end up in their inboxes, and if they have something to say, they can just click Reply.” This openness to discussion allows his readers to trust him even more and his way of writing, which resembles a conversation, make him more accessible. Focus on a narrowly defined target audience. For example, industry colleagues and people with similar interests. Question: Who are you writing for? Personalize content and style according to your audience. Send them what they actually want to read about, again and again. Question: What would I like to see? What would get me to open an e-mail? A good place to start is to talk to family, friends and colleagues. Get an idea of ​​the subject line hits the right tone for other people. Email is not too far formulated content. In a world that becomes increasingly mobile, making long and wordy emails often more harm than good. Texts are often read on small screens, people are busy with their lives, and you have less time to capture their attention. Write as if your audience is distracted by something else. Be brief and concise. Format the content of easily digestible sections. If you have more to say, linking to your website. Also remember that the mailing design matters. Presenting content in an attractive manner with pictures or typography. Simplify and encourage reading. Give your readers something of value, something that not only blends into the background noise of life. A little personality goes a long way to make emails more interesting and rewarding. People are social by nature. So why not make email more personal and socially ?! With the mailing tool mailRelate you can with a few clicks to make mailings and get a better contact with your customers. With mailings follows a sharing function that simplifies the ability of recipients to share with their friends and thus to pass on your message to even more. With automatic management of subscribers and the corresponding statistics function provides you with clear reports and allows you to do simple follow-ups which could ultimately increase your sales. Have you ever wondered what color to choose? And if you already have a color, what new color would fit well with the one you’re already using? Color has a great significance and is very subjective. What evokes a reaction in one person, can elicit a very different response in another. Sometimes it depends on personal preference, while at other times it depends on a person’s cultural background. Color theory is a science in itself and there are many different studies of how colors affect us, either individually or as a group. However, we can help you a long way when you’re standing there in two minds over what / which color / colors to choose between to give life to the project you are working on. Whether you create websites, a new kitchen, scrapbooks, fabric patterns or designs can Adobe Kuler web application help you with it. For with Kuler you can quickly and easily navigate through different color variations and test thousands of themes already created by other users. The themes can be created in the color spaces of different kinds; RGB, CMYK and LAB, and they can also be represented as hex values ​​for use on the Web. When looking through all the themes you can sort them randomly or merely produce the newest, most popular or top rated. You can also search using keywords, title, creator, or hex color. You can even create your own color theme and upload if you want. It only requires a log-in page. Shopping, visiting various social networking sites, read email, find places, perform banking transactions, Googling. They are some of the common tasks we do when we surf. You‘ve probably done all these activities yourself sometime. If you are like many others, you probably do these things every week and many of them every day, even. We at WebbPlatsen, along with other designers and developers worldwide, definitely want you to have the best possible web experience. In fact, we engaged in the design and development of web sites spend countless hours each week to discuss and research on how we can make your Web experience so much better. But by using an older browser this possibility may be restricted for you. So read on to learn how you can drastically improve your experience on the web. What’s wrong with old browsers? Old browsers (especially Internet Explorer versions 6, 7 and 8) are less stable and more vulnerable to viruses, spyware, malware and other security issues. Which is obviously great problems to worry about, especially for those who shop online. First, old browsers are very slow. Every web page that is loaded in a browser, perform a variety of tasks. One of these tasks is to download different files. These files contain images, scripts, and other resources that help to improve the look and functionality of the site that you are visiting. Old browsers do not perform these tasks at the same speed as new browsers. This means that your Web experience is much slower and can sometimes even cause the browser to crash or freeze. The new browser supports new web technologies (HTML5 and CSS3). These languages form the basis of many websites today. But unfortunately, many of these new websites not look or function properly if you visit them in an old browsers. Why is new browsers better? Significantly fewer crashes or freezes. They are much safer and better able to protect you from viruses, malware and hijacking. Web pages load much faster. Provides a larger page / image area of a website. A wide range of useful optional plugins and extensions that provide additional features to enhance your online experience. New browser updated to the latest version automatically, or notify you when there is a new update to download. The last item in the list mentioned above, the new browser will automatically notify you if an update is a good feature. When you have a browser that is updated, you also automatically gain a number of important advantages in addition to those already mentioned. You will rarely if ever encounter a website that says “Your browser can not display the website”. If any known security risk are present, they will be corrected automatically. Each time the browser upgrades the browser usually becomes faster, which means that the time you spend waiting for pages to load will be minimal. There are countless reasons to upgrade your old browser and start using something new and updated. So trust us when we say that your Web experience will be infinitely more enjoyable if you choose to do so. No matter what you do on the web, read email, shop, bank or something else, an updated browser lead to a safer, faster, and far more beautiful experience. The new version of WebbPlatsen’s cooperation and communication program Work2Go 7 has now been launched. A new version with similar web interface as the previous version, but with a series of new smart features. On WebbPlatsen’s home page for Work2Go is a guided tour to follow to quickly and easily get introduced to the news. There is also a list for printing for those who want to know more. Versioning and check in / out function of the files in the briefcase. Smoother handling of email addresses in bubbles that can be drawn between the different address fields and edited by right clicking. Set the date and time of sending e-mail at a later time. Filters for sorting, marking or forwarding outgoing messages. Integration with LinkedIn and WebEx. Always display images in the message itself from trusted addresses / domains. Reminders of tasks and improved user interface in the to-do list. A few years back there were not as many browsers as now. Now there is a wide variety to choose from. The question is which one to choose. One of the most important to consider when you choose browser is security. One factor to keep in mind is how security issues are handled and how quickly they are resolved. Problems arising in Chrome, Firefox and Opera is considered to be less serious and are often quickly resolved, unlike those that occur in Internet Explorer. Take extra care with the less popular browsers, as they tend to get security updates later than the more popular ones. Another factor to keep in mind is whether it is possible for the user to set preventive measures for possible security vulnerabilities in the browser. Internet Explorer, for example, be made much safer if the user turns off many of its features. However, this can lead to certain websites and applications will not work as intended, which is obviously not a good solution either. Note also that all browsers are more secure if you are logged in with the account with limited rights, such as the Windows default account. Another security risk is a browser add-on. With safety in mind, you should use as few extensions as possible and always update them. Safari for Windows is not updated more and therefore we do not recommend this browser more. 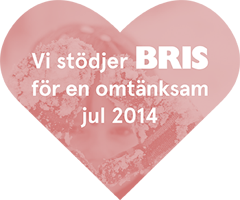 Bisnode Credit AB submit WebbPlatsen i Sverige AB the AAA rating. Because of the costly investments in advanced technologies in 2009 dropped WebbPlatsen its Trust Ratings, but now we are back on top again. AAA is an elusive rating that only 2.9% of all Swedish companies succeed. What does it really mean, to be a AAA company? AAA (Triple-A) stands for the highest credit rating. In short, it is a company that is safe to work with, but also to be a customer of. To get this rating requires, among other things, that the company has been active for at least 10 years and have ratios that are significantly above the industry average. The site has maintained a solid balance sheet since its inception in 1998 and has survived the IT bubble and the financial crisis. WebbPlatsen considered to be long-term and do not intend to leave somewhere in a hurry. “Being a AAA company demonstrates to our customers that we are a stable supplier and partner they can trust and who will there also tomorrow to give the best service” says Mats Djärf. To obtain the AAA assessed companies of 2400 points relating to the economy, fired operations, the establishment and ability to pay. AAA company must outperform its industry significantly at all assessment points. WebbPlatsen which has a pretty broad expertise available in three different businesses; Graphic design, Data processing, hosting and Computer programming. The statistics below show how well they stands out in comparison with other companies in the same industry. A total of 0.6% of all companies in the same industry. Overall 1.7% of all companies in the same industry. Overall 1.2% of all companies in the same industry. In the 1950s, when home electronics such as vacuum cleaners and washing machines became more common, there was a belief that domestic tasks could be done in a fraction of the time. We now know that it did not work that way. Our definition of purity changed. Instead of wearing the same underwear several days in a row, we began to use a new pair every day, thus increasing the amount of laundry immensely. In short, the new technique allowed us to work more, not less. Our work environments have followed a similar path. Tools like e-mail allows us to communicate more, rather than to make life easier. In fact, many people feel overwhelmed by the amount of email they receive. E-mail has changed our expectations of communication. Most of us feel that we must always be available. We are bound to our inboxes and, like Pavlov’s dog, we have to check who we have got a new e-mail message every time the ping to. We are always available, will be constantly interrupted and constantly overwhelmed. Like it or not, but email is still a necessary evil. But that does not mean it has to control us. We can tame the monster, and it all starts with doing less. Like any animal, the more you feed it, the bigger it gets. It is time to put the e-mail monster on a diet. We can achieve this in a simple way: by using e-mail less. Believe it or not, but to write much less with email but still effectively communicate with our customers and colleagues is quite possible. You probably do not need to send all the emails as you do today. You can certainly reduce the number of people that you copy into your email message. Remember that the more emails you send, the more you will get back. It’s that simple. E-mail is not always the best form of communication. A personal meeting or a phone call is usually very effective. For what we are saying is really just a small part of what we communicate. Tone of voice and body language says much of our message and is also an important part of communication. Instant messaging over a chat is another option to consider. Even if it’s intrusive at times, it may be perfect for quick questions. The less you write in an e-mail message, the more concise answer you will get. People tend namely to reflect the behavior of others. You may feel short emails are less friendly, and will be perceived as unpleasant, but this problem can be avoided. Now do not get me wrong, to be friendly and personal with customers is important. But e-mail is not the answer. If you want to chat, call the person instead. Email to feel more like Twitter than traditional mail. Try to summarize your message as soon as possible in your email. This will make it easier for the reader to get the gist of your message. In addition, you will notice that some will begin to do the same in their e-mail, making communication much faster. An even easier option to get their short messages accepted and not perceived as unpleasant is to use the signature “Sent from my phone” that many people use these days. A good excuse to get to the point quickly. The easiest way to cut down on response is to tell people that they need not answer. For example you can write FYI (for your information) in the subject line. But this stuff obviously no unsolicited e-mail. Most of us get a lot of unsolicited e-mail, despite the excellent spam filter. These emails are often newsletter that we have never subscribed to, or messages from companies from which we once made a purchase. Whether we ever agreed to receive these emails, clutter they now our inbox. You may be tempted to just delete them and then get a better affordable inbox. But take the time instead to find the unsubscribe link. This will prevent these companies to contact you again. If you do not find any unsubscribe link in the message, create a filter that automatically removes the email from the sender for you. It takes you only a few minutes and will save time and distraction in the future. With reference to our previous connection to Pavlov’s theories, we can not resist checking our inbox when we hear the sound of a new e-mail message was mostly for fun. But do you check, for example, your e-mail every five minutes will result to over 32,000 interruptions per year! Do we really need to check our inbox so often? The majority of all e-mail coming in are either unwanted or can safely wait a few hours. The number of email messages that truly require urgent measures are often actually relatively low. Start by turning off the feature that allows or blink when you get new messages to your inbox. Then we have the problem that we perceive certain emails anxious even though they are not. It’s just a matter of educating our clients not to expect an immediate response. Of course it is not always possible. A solution to this is to activate an automatic reply message, a short and sweet autoresponders to announce that you have received the message but the reply may take some time. Anyone who sent a message to you get a confirmation that you received the message directly, thus becoming less impatient to receive answers from you. Then create filters to get incoming messages from the addresses you already know that you do not need to answer, for example, the newsletter that you subscribe to. The filter that sorts them into separate folders automatically. If you have time to act promptly do so. This may mean that the answer or complete a task. But do not act immediately if you have something more important to do. Too busy to handle e-mail immediately? No problem. Mark it with a label so that you easily see what has been put aside, to be dealt with at a later date. Many e-mails that we receive does not require any particular action, but only contains useful information. In such cases it is sufficient to save them in a folder for future reference. If the email is spam or missing any long-term value, delete it. Some e-mail messages require action, but you might not be the best person to do it. In these cases, delegate this task by sending the message to the right person. The bottom line is that your inbox is just a repository of raw emails. Once you have read it and decided what to do with it, move it out of your inbox to make room for future emails. You may be intimidated by the thought of having to process all those emails when you stare back at your inbox. This may seem like too much work. But I promise you, it will be worth it. If your inbox is too overwhelming, save away everything older than a week. If any e-mail message has not been treated in over a week, it is probably still too late to answer it now. The trick is to treat everything in your inbox. Do this and I promise you’ll never look at emails with the same horror again. If you also want to be able to work with your e-mail in an e-mail program on a computer, mobile or tablet, you can create an account for it. We recommend you to use IMAP as account as POP3 download and delete your emails from Work2Gos server and saved on your hard drive instead. There is a lot to think about and good things to know when you want to work with their e-mail in a mail application, we would like to share with you. Create an IMAP account in your email program for your Work2Go account. Then you are not dependent on a single computer for reading and sending e-mail. If you create IMAP accounts you can create on your computer at work, one on your computer at home, one on the phone and on your tablet. And if you go away somewhere without having any of the computers or mobile with you, you can log into your account in a Web browser, on any other computer. Where and how you log into your account when you create IMAP accounts, it looks the same and you always have access to all folders, including folders that someone else has assigned to you. Some e-mail programs create folders for example, the messages you send or delete. This usually does not seem so clear when you open the email application on your computer. But if you would log into your account in a Web browser, you see clearly folders such as called sent and deleted messages. But does it matter so much then? Well, if you, for example, send and delete e-mails on your mobile and in a browser, it gets a little messy. E-mail you send from your mobile will be put in the extra created Sent folder at the bottom among your folders in the web interface. But if, however, you send e-mail from the web interface, ports sent message in the Sent folder. Do you want to later find an e-mail message that you sent when you are logged into the web interface, you will not find the message in your phone’s Sent Items folder, but it created an additional folder further down in the list of folders. But why do Work2Go this? It is not Work2Go that creates the extra folders, but the technology itself that handles IMAP. In the e-mail application’s settings, you can link the folders in the program with those on Work2Gos server. In Outlook, go to the account settings and then to more settings. 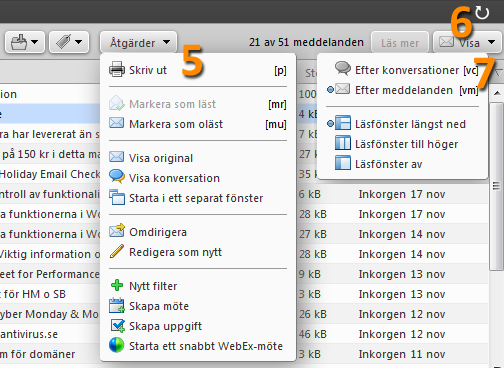 Select each Work2Go folder. 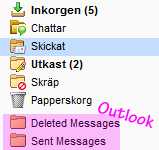 Move any messages that are in the old extra folders first and then delete the folders, they are at the bottom of the list of your folders in the inbox, both in Outlook and in the web interface. But how do you know which sent folder that are Work2Gos? Well, usually they look like simple folders without any additional symbol. It is not only more carefree with IMAP, it is also safer. Whether your phone is stolen or your computer has crashed, all your e-mails are always securely saved on Work2Gos server. Or if you have a new computer. Then it’s just to add a new account on your new computer and all, new and old, messages are available there again. If you have a POP3 account on your old computer you would need to take a backup of the old e-mail messages, which you then have to import to your new computer. However, if you only manage your e-mail on one computer and not have any need to access your e-mail in more places, the POP3 accounts is a good idea, then you never have to think about account limitations. But it is probably the only advantage of POP3 accounts. The risk with this is that if the computer you have your e-mail would fail, and you have not made a backup copy, you lose all your emails. Then it does not matter that we make backups of your account, because all e-mail anyway disappear from Work2Gos server and then also in the web interface, as soon as you launch your email program on your computer. Configure your e-mail program so that messages are stored on the server, eg 30 days or more when available. In Outlook, you can find this setting when you go into your account settings > more settings > the advanced tab. Inbox is the only folder that you access if you set up a POP3 account in one computer. Sub-folders and shared folders are not available. One of the most difficult thing during a working day is to maintain concentration. It is not longer that usual to sit alone in an office and be able to work undisturbed. Many share rooms, others sit in larger offices. Your tasks may consist of creative duties and solve complex problems that require sustained focus, but at the same time you are expected to always be available to others. Your concentration is constantly interrupted by the ping from the phone and e-mail program’s icon to beg to get your attention. One. Start out with only booking short periods. Let them successive grow longer. Start with an hour and then gradually add 15 minutes when you notice that it works. The key is to never allow any distraction during your focus time. If you loose your concentration and check your Facebook instead, cancel the entire period and try again later. Not even a little bit of distraction is okay during these periods. Be disciplined. Two. Activate your away message for incoming e-mails and change settings for how tour browser handles incoming messages so that you won’t be disturbed when someone is trying to contact you. Three. Focus on a concrete, clear defined task that you have prepared. For example, you should write an article, do research work first, so that once you isolate yourself, you can fully concentrate on writing. Four. Put yourself in a different place in your focus period. Go to another room, a library or another quiet place outside your workplace to make it easier to focus solely on the task you have planned to work with. Five. Use only paper and pencil during the focus period if possible. This will avoid any possibility of distraction that can easily emerge in a computer. This constant battle between concentration and distraction is a serious problem, both for our results and our own sanity. Imposing focus periods will not solve the problem but helps you still a long way. Work2Go is a collaboration tool with e-mail from the WebbPlatsen i Sverige AB where you can disable and re-enable messages, whether it is e-mail or instant messages, receiving, and viewing to get your attention. In the shared calendar tell everyone that you’re already booked and for longer periods of focus, activate an away message. We accidentally ended up on a few large global lists for spam, which means that some e-mail messages can not be delivered, it is being removed but it takes time. The problem is now solved on the largest list. Most e-mail is now delivered as usual. It is not easy to reveal phishing, without opening the e-mail message. Every time a message arrives, the recipient receives an impulse to read it. Phishing is all right about it, to get the receiver to bite the bait and open the attached file or click the link with malicious code. Here are three useful tips to remember so you do not get scammed and exposed to viruses and Trojans via email. Beware of any unknown names. All e-mails purportedly sent from a financial institution is usually fake. No bank sends emails to their customers nowadays. Keep in mind when you read the subject line of the message. Subject lines that is about to attract the curiosity should be handled with caution. Is there any attachments? It is best to avoid opening attachments. Always ask yourself first why you should open them. Are you expecting an e-mail with an attachment? Why is there even added an attachment? Be suspicious of any packed zip files as well as files with the file formats for applications such as Word, Excel, Powerpoint and Adobe Reader (.doc, .docx, .xls, .xlsx, .ppt, .pptx, .pdf). All messages from unknown senders with unclear messages are usually scams. Checking the sender, subject and attachments should have sorted out most phishing attempts. But suppose that everything seems okay so far, there are still good reasons to the contrary. Scores of hackers out there that hijack one’s friends ‘friends’ accounts. It’s usually okay to read an e-mail message as plain text, if you do not click on any links. Phrases like “Dear business associate …” are clear warning flags, which also applies to emails from completely strangers in unknown cases that appeals to one with first name. Also be careful with content that promotes any kind of document, for example, demand for more information, warnings or other. Often used tricks to deceive the recipient to act, for example, by formulas that evoke emotions or by referring to a person with influence or power. Heading head of an e-mail message contains useful information that can be used to confirm suspicions of a sender is out fraudulent purposes. There is information about the sender and recipient information as: IP addresses, operator information and which company is designated as the sender. It also indicates whether the message has gone through some anti-spam services, and given the green light. Best protection against phishing is a combination of common sense, education as well as good antispam protection. On this website we use AVG. Just because it is a powerful protection against sophisticated threats, but also because it is a flexible program that runs by itself without being in the way in your computer. Learn more about AVG on avgantivirus.se and yes, it is we who are the largest reseller for AVG in Sweden. Every year Google release a list of the 10 worst ideas you may have when choosing a new password. This list is created after conducting a study with over 2000 participants. This way you get a better understanding of what kind of passwords commonly used and can thus warn of the worst ideas in this list. As you can see from the list below, people continue to use passwords that consist of very easily available information – often via social media like Facebook. This means that their online accounts are extremely vulnerable to hacking and can be compromised with a minimal effort from the villain’s side. Changing your passwords frequently, but avoid those presented in the list. So, if your passwords (yes you do use different ones for each online account you have, right?) Contains something from the list, you should definitely replace them! In conclusion, we are now pleased to share with you some simple tips to follow when choosing a new password. DO NOT use a password that contains the name of someone or something that you like very much. DO NOT include any information in your passwords that can be easily detected by watching one of your accounts on social media. DO NOT share your password with anyone – regardless of who they are and how much you trust them. DO NOT write down any of your passwords. In the Google study, it also appeared a few bad password habits, namely that 48% of the participants shared their passwords with others and that 3% of them write down their passwords on a note that they save by their computer. Naturally, we do not suggest you to do something like that if you care about your safety online! Most of the features are still there, but may have changed places. New look can sometimes complicate things for us. Many of us out there who are creatures of habit and think it’s a bit tough to change. Just because of this we have now put together the following images for you to easily find the right way around in updated Work2Go 8. 1. Click New message to create a new e-mail message. Click the arrow to book a new appointment, create a new folder, label etc. 2. Right-click on the orange highlighted field (in the picture) and select the categories you want to be visible with a check mark by clicking on them. To show the bounding box, select “Options”. You can change the order of the different categories by dragging and dropping them. 3. Select the message you want to move to a folder and click the button in the toolbar and then select the appropriate folder. 4. Select a message and click on the tag to select it. The menu that appears also allows you to remove a tag. 5. Under Actions you will find the functions you can perform, adapted along where in your account you are. For e-mail you can for example print a message, mark it as unread in the list, redirect it to a different e-mail address (ie forward it without leaving any trace of you), edit a received message just as if it was you who wrote it (“Edit as new“) or proceed from a message when you create a new filter or book an appointment. 6. Click the circular arrow if you want to reload and update the page you are on. For example, to update the changes made in the settings, display mode, or to see if it has just entered a new message in an added external account. 7. Under View you will find the different display modes, just like before. The set-up for notifications when you choose to view them by conversation has improved and it is now much more clearly. 8. Button to send you will find in the top left corner. If you want to schedule and send it at a later time, simply click the arrow and select Send later. 9. Here you will find the button to check spelling. 10. Here you will find the opportunity to add another signature than your default signature. There is also the option to request a read receipt by the recipient and choose whether the message should be written as formatted text (which you can choose the font size, bold, strikethrough text, etc.) or as simple and plain text. When you reply to a message you also get the option to specify how you want the original message to appear in your reply. 11. Attach a file from your computer or briefcase to your message. You can also attach selected contacts’ contact cards and other e-mails from your inbox. 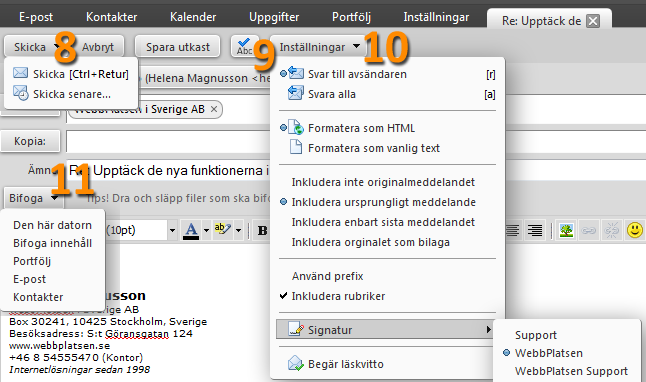 Most of the functions are also available by right-clicking or by selecting and then drag and drop. We would like to thank you for the good cooperation in 2014 and look forward to continuing this in 2015. This year we give our gift to SOS Children’s Villages emergency fund for Ebola and BRIS a thoughtful Christmas for all children. On Thursday 15 January during lunch, we will perform maintenance concerning Work2Go. This will start at 12:00 and is expected to be finished within two hours. The service will not be accessible while work is in progress, incoming e-mails will however be stored and made available as soon as we open the service again. Please accept our apologies for the short notice.